A different beluga whale swims under ice at the Arctic Circle dive center in northern Russia. Members of the public wait to catch a glimpse of a beluga whale in the River Thames close to Gravesend, east of London on Wednesday. 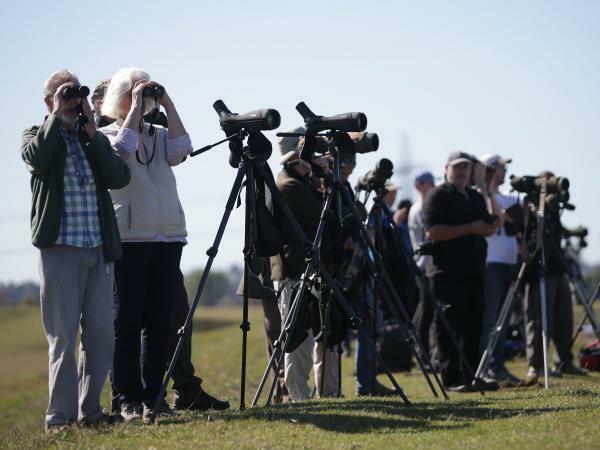 Dave Andrews couldn't believe what he was seeing. And then he couldn't believe what he was tweeting. "Can't believe I'm writing this, no joke - BELUGA in the Thames off Coalhouse Fort," the Norfolk, England, resident posted on Twitter Tuesday. The ecologist and ornithologist, as described on his Twitter account, had spotted a beluga whale swimming in the River Thames east of London, far from its normal habitat. A beluga swimming in the Thames is undoubtedly rare, and a social media frenzy ensued. Sky News caught the animal on camera from a helicopter above the river. Shortly after that, the Natural History Museum in London quoted their whale expert as saying, "The white body colour, absence of a prominent dorsal fin, bulbous forehead and general swimming motion all suggest very strongly that this is a beluga whale." On Wednesday, the whale was still in the river and had been given a name, Benny. No rescue is necessary at this point. Teri Charlton of the British Divers Marine Life Rescue — an organization specializing in the rescue of marine wildlife in distress — told NPR that while the organization is concerned that the beluga is so far away from where it should be, the animal is still swimming strong. "We will monitor it for now and track its movements," she said. The British Divers Marine Life Rescue independently confirmed it is a beluga. "The lack of a dorsal fin was a giveaway," Charlton said. Beluga's genus name, Delphinapterus, translates to "dolphin without a fin," according to NOAA Fisheries. They lack a dorsal fin so that they can more easily swim under ice, which is a standard fixture of their Arctic and sub-Arctic environment. Mature belugas have teeth and are known for their range of vocal sounds, earning them the title "canary of the sea." Belugas are generally an Arctic species that, in Europe, are usually found in the seas of northern Norway and Russia, Phillip Clapham, director of the cetacean program at the Marine Mammal Laboratory at the Alaska Fisheries Science Center, told NPR. He has worked with whales and dolphins for almost 40 years, he told NPR, but he doesn't know exactly why this beluga is so far south. "With many species, you'll get these animals that just sort of wander out of their range, and there's no rhyme or reason to it. They may be lost, they may be just exploring, they're often — though they are not always — young animals who are inexperienced. So, could be any of those things," he said. He doesn't think any conclusions can be drawn that are applicable or relevant to the broader beluga population from this rogue behavior. "You can't read too much into these lost or wandering animals," he said. Belugas are known to be very social animals; so the fact that this one is alone is also strange. While Clapham said a sighting like this is "very" uncommon, sightings of beluga whales in unlikely places have happened. Clapham noted a beluga sighting off Cape Cod in 2014. He also cited a group of belugas that was frequently spotted off the coast of New Jersey in 2015. The species can occupy river estuaries, where river water and seawater meet, like where the whale was spotted in the Thames. Clapham said there is a permanent population in the Gulf of St. Lawrence in Canada. The population there occupies the estuary of the Saguenay River, which Clapham said lies on a similar latitude as London. "It's at 48 degrees north, which is actually about the same latitude as London — London's 50. But it's very different oceanographically there, I mean it's colder, and that population's resident," he told NPR. 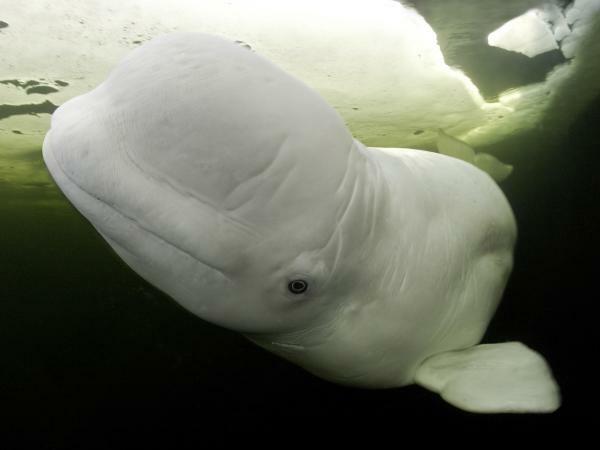 With a thick layer of blubber that accounts for 40 percent of the whale's body weight and helps them keep warm in freezing waters, the wandering of the Thames beluga to the south of its normal habitat likely cannot be attributed to climate change. "This almost certainly has nothing to do with climate change," Clapham said. "What we're seeing with climate change in the Arctic — in the Pacific Arctic, where we work, up off Alaska — is warming temperatures, and we're beginning to see some species, like the humpback and fin whales moving — the range of those animals is extending farther north." All belugas are protected under the Marine Mammal Protection Act in the United States, and in Alaska, one beluga population is listed as endangered. "The endangered Cook Inlet beluga whale population has declined by nearly 75 percent since 1979, from about 1,300 whales to an estimated 328 whales in 2016," NOAA Fisheries reports. However, globally, NOAA projects belugas may number in the hundreds of thousands. Benny the River Thames beluga has likely made a much bigger splash than any of those others, though. To quote the children's songwriter and singer Raffi in his song "Baby Beluga," this "little white whale" has definitely been "on the go."